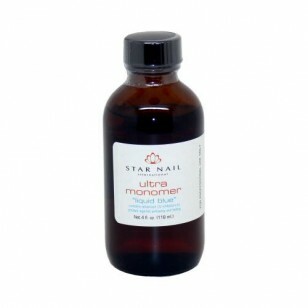 Natali Products proudly presents the Star Nail Ultra Acrylic Monomer Liquid! Dubbed as “Liquid Blue”, this monomer liquid is what every nail technician needs to create acrylic nails with bright, vibrant colours that will last. Your client should not worry about unnecessary breakage. Yes, it’s that durable! When mixed with Star Nail’s acrylic powder — available in clear (NL2682-Clear), white (NL2682-White), and pink (NL2682-Pink) — you will be able to craft the ultimate fashion nails for your client. These two are one powerful combo that you need in your nail technician supplies! Even better, we offer the Star Nail Ultra Clear Acrylic Kit (NL2681) so that you’ve got all you need for producing professional acrylic nails. Soon, your nail spa will be the go-to spot for beautiful nail enhancements. Complete your manicure supplies when you buy the Star Nail Ultra Acrylic Monomer Liquid from Natali Products. Its affordable price will surely put a smile on your face! We are your reliable source for high-quality nail supplies in Canada. Also, be sure to check out our site and visit our showroom for more professional skincare and beauty supplies.